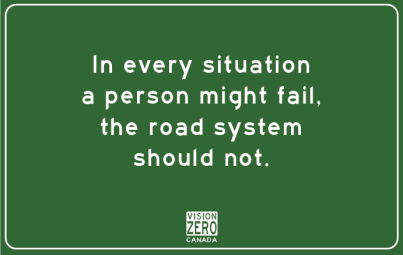 It’s time for Vision Zero Saskatoon. Let’s get it right. There’s been a lot of talk around town recently about improving the safety on our roads. The city has been trying to balance traffic flow and driver convenience with selective traffic calming measures to address the all too frequent collisions between drivers and vulnerable road users in Saskatoon. The city is reporting that between 2007 and 2016, 69 people have been killed and 12,666 people have been injured on Saskatoon roads. According to the Saskatchewan Health Authority 129 pedestrians visited the emergency departments at Saskatoon hospitals after collisions with drivers between Jan 1 and Oct 31st of last year. The City of Saskatoon is in the final stages of completing Neighbourhood Traffic Reviews (NTR’s) throughout the city, in which the discussions concentrated on traffic safety concerns and solutions. The reality is though that not enough is being done at the moment to seriously address the severe injuries and deaths that are occurring on roadways in our community. The good news is that city administration has seen the light. In a presentation to the Special Policy Committee on Transportation (SPCoT) on September 10th, administrators advised “To address this significant level of injury and death, safety must become a priority over speed and convenience in both the design and operation of Saskatoon’s roads,” and are recommending adopting Vision Zero in principle. SPCoT, which includes 5 Councillors and the Mayor, endorsed the motion to adopt Vision Zero in principle for Saskatoon! This is the first step in a potentially monumental shift in the way our city moves. So what exactly is Vision Zero? There’s plenty of information and misinformation out there. We’re not get into all the detail and nuances. Simply put, the point of Vision Zero is to take human error and education out of the equation by creating fail-safe systems in the design of roadways. It is a data-centric approach that shifts the focus away from designing roads for convenience and prevention of all collisions toward concentrating on eliminating the severe and deadly collisions. 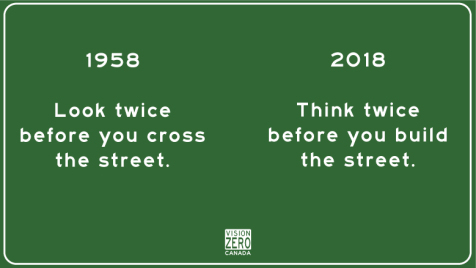 Vision Zero Canada is a great resource for those that want to get into it in further detail. The SPCoT recommendation is huge news, but Councillors and city admin need to continue to delve deeper to understand how if they follow through with this, it needs to be the lens that they filter through all decisions about traffic safety. One thing that concerns us is that in the same SPCoT meeting admin recommended, and Councillors endorsed, a motion for a survey/voting system for affected citizens when traffic calming measures are being implemented. This is likely a result of the politicized citizen uproar regarding traffic calming measures on 9th St and Clarence Avenue, but it is totally contradictory to the data-based Vision Zero approach. The city needs to realize that you can’t have both at the same time. I did notice that when browsing the rest of Monday’s agenda. That kind of safety-by-plebiscite—traffic calming based on how ppl feel, rather than on actual data about where & why people get killed or seriously injured—is not a good way to reduce harm or encourage active mobility. That is also where he sees issues with the documents Saskatoon city admin are proposing related to Vision Zero. There are still too many remnants of the old shared responsibility mentality making their way into Saskatoon’s preliminary proposal. These remnants include the language that it’s the responsibility of “all road users” as well as the “E’s” (Enforcement, Education and Engagement in particular). Vision Zero puts the onus on the design, not the users. The city’s report does get a bunch right as well and that gives us hope. Right now city staff are working on this off the side of their desks. We’re optimistic that once a full-time employee is dedicated to leading Saskatoon’s Vision Zero charge, they will sniff out the inconsistencies and tighten up our strategy for a legitimate safe systems approach to traffic safety. Then it’s up to Councillors to resist political pressures and do the right thing while leaving it to staff to trust the data and the Vision Zero process. We believe it can happen. The time for Vision Zero in Saskatoon is now! Nov 27-28 2017: Council Budget Meeting approved funding, $40,000 for launching the Vision Zero Initiative+education campaign. May 2018: Planning session with stakeholders facilitated by Vision Zero Advocate Institute. Sept. 10, 2018: Admin present report on Vision Zero to the Special Policy Committee on Transportation, Vision Zero adopted in principle by SPCoT. 2019: Vision Zero Action Plan Report developed and presented to council.